Let the Good Times Roll! Cheery Updated Cottage, Redwood Views, Quiet Neighborhood. Fully-Fenced, Landscaped Garden with Hillside Terrace/Overlook, Outdoor Dining Patio. 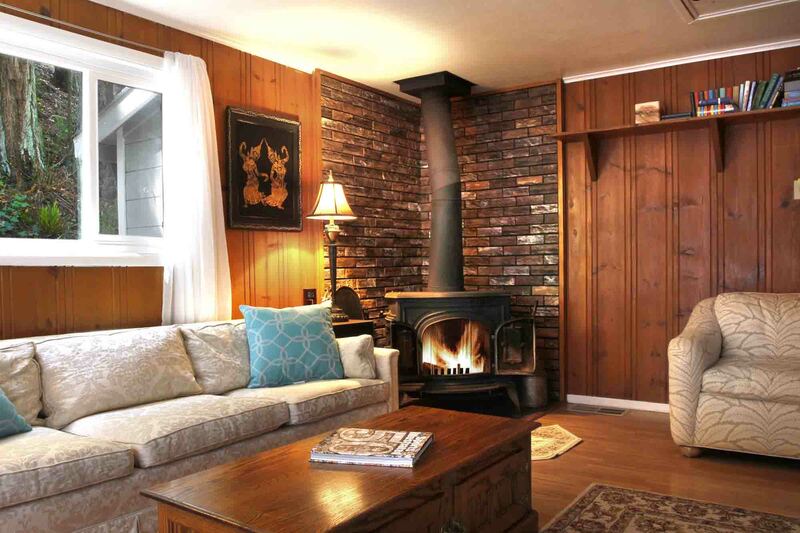 3 Cable TV's, Central Heat, Fireplace & Woodstove! 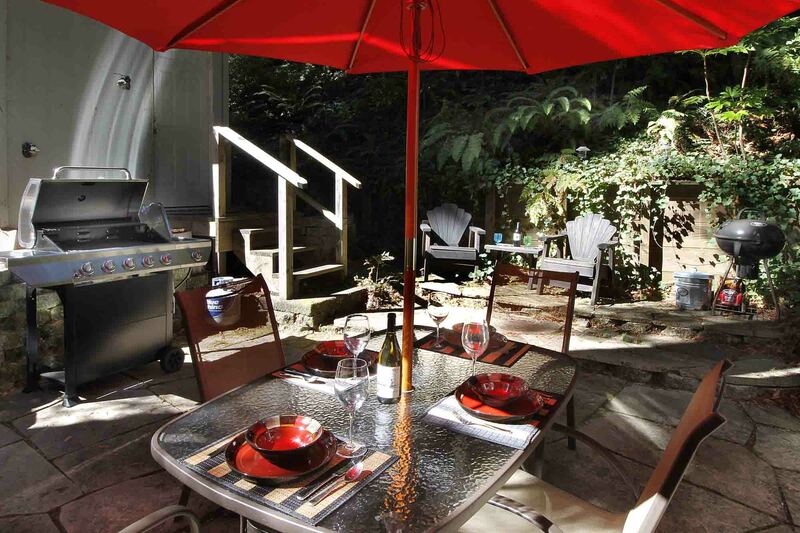 Short Drive to Downtown Guerneville, River Beaches, Wine Tasting, Golf, Hiking, Coast. Wi-Fi, Unlimited Domestic Long Distance. Keyless Entry. Your Well-Behaved Dog is Welcome! The kitchen and dining area are open to each other with the living room adjacent. There's a short hall with two bedrooms and bathroom. Out the living room doors, at the rear of the house, there are terraced patios with outdoor dining, landscaped garden, loungers, and steps to a hillside overlook with seating area. The large front deck also has outdoor dining. The house is approximately ~900sf. 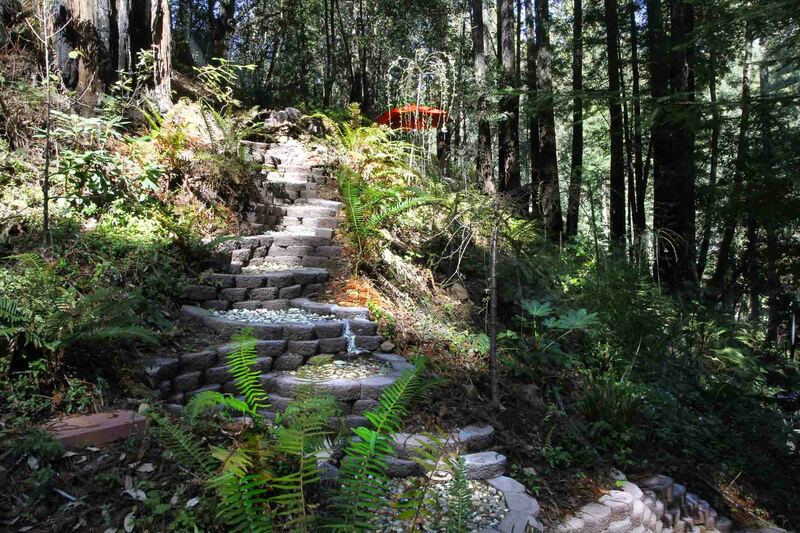 Note that stone steps up hillside to overlook are steep and irregular. Central Heat, Fireplace (dining/kitchen), Woodstove (living room). NO A/C. Please bring your own beach towels, toiletries and firewood. "The cabin is in a wonderfully secluded area"
If possible, arrive during the daylight. The cabin is in a wonderfully secluded area nestled in the trees. It is perfect if you are looking for a quiet serene area in which to relax. Yet it is perfectly located for wine tasting, walking through nature or taking a drive and exploring the Pacific. We truly enjoyed our stay. "We really enjoyed staying in this home." We really enjoyed staying in this home. Our host was thoughtful and provided everything we needed for a relaxing stay. 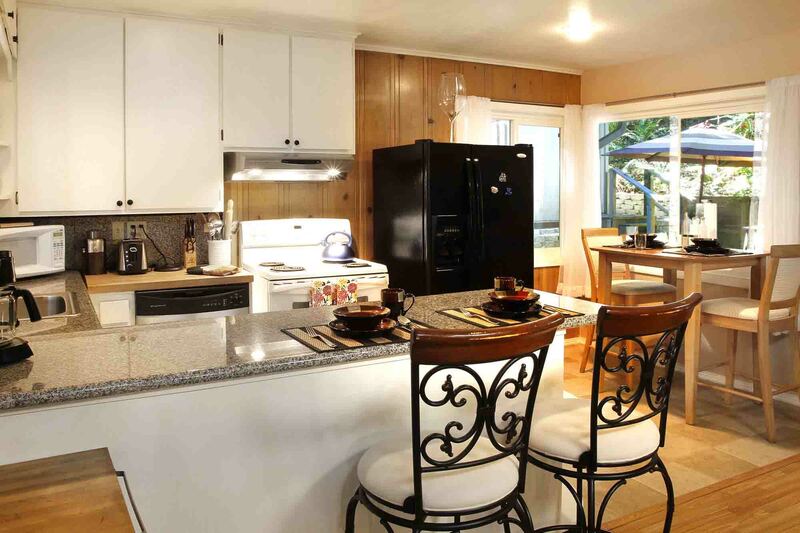 The area is quiet but close to wineries, Bodega Bay, Jener and other area beaches. We thoroughly enjoyed our hike in Armstrong Park, land of the redwoods. I would recommend this home to others. Very nice house. 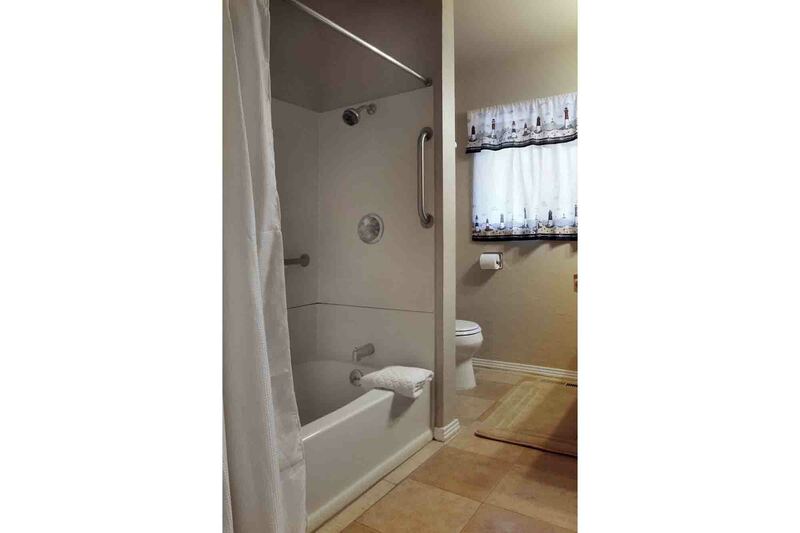 Very clean with all the amenities you could want. Lots of nice backyard space. The neighborhood was slightly more dense than expected, so in the summer it might be a little loud when all of the surrounding cottages are occupied, but overall a really nice place to stay and at a reasonable price. "Beautiful space with a wonderful atmosphere"
Beautiful space with a wonderful atmosphere. The home was huge, inviting and provided amenities that allowed for a relaxing break. Would definitely stay a the Getaway again! "everything about the house was just fine!" Really good place to run from bay area problems for a while. There was a flood in Gureneville a couple of days before arrival - I checked in with the host about flood risk, and they both reassured me about safety and offered a 100% refund if I wanted to cancel. We went anyway (and saw all of the flooded vineyards) - everything about the house was just fine! Great place! Nice location among the redwoods. Great outdoor spaces in the back and on the porch. House was very clean and beautifully decorated. Great for two couples. Kitchen had everything we needed to cook ourselves and there was easy parking in the driveway. Very clean. I would definitely stay here again! Cozy house that’s tucked away and right in the woods. The fenced backyard is perfect if you have a dog, and the house itself has all of the essentials for relaxing, cooking, etc.
" 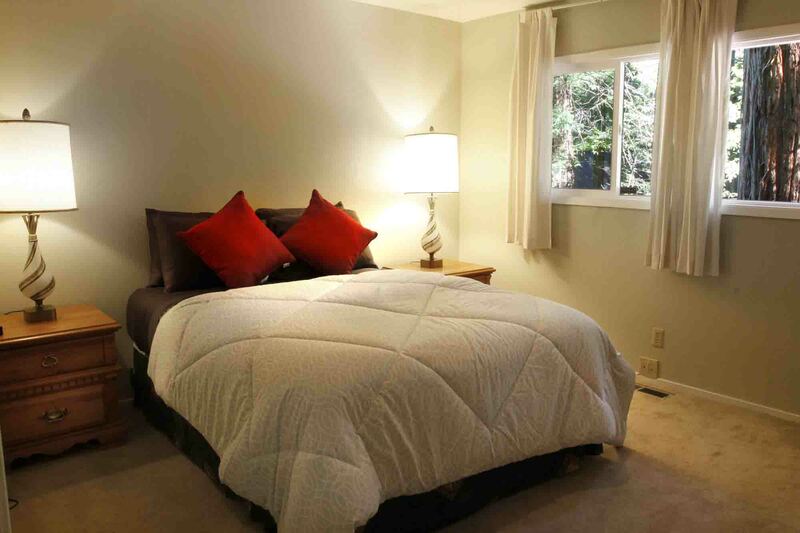 This home was especially delightful"
We often travel to this area as a getaway from the city. 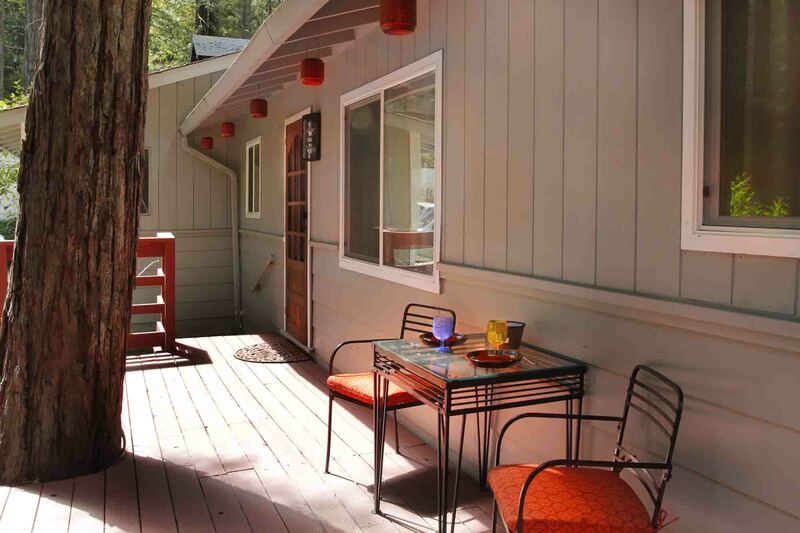 This home was especially delightful as it was away from the areas I already knew, tucked into a great neighborhood that was fun to walk around, see so many cute cabins, enjoy the sequoia's and the fall colors! "If you love the woods, this is a great location." Amazing location on a quiet street. If you love the woods, this is a great location. Great stay! The home was just as described and very tidy. 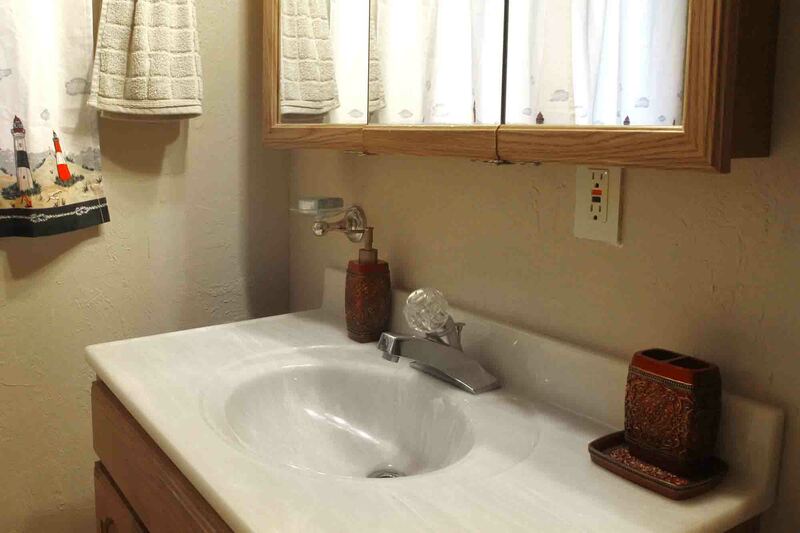 What an adorable home with pleasant surprises and secret gardens at every turn! Thank you for providing everything one needs to prepare an outdoor barbecue. Comfortable beds with beautiful decor and outdoor area made our stay memorable. We hope to see you again soon. Thank you! 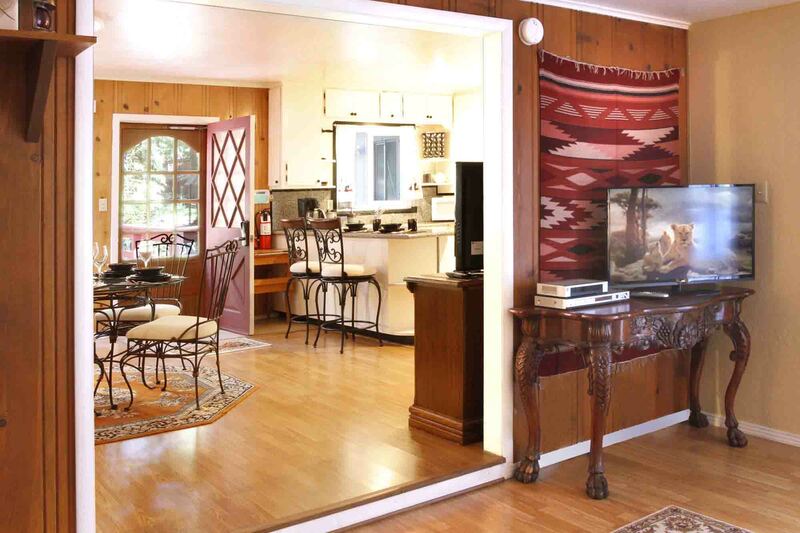 Wonderful space tucked into the Redwood forests of a Guerneville. 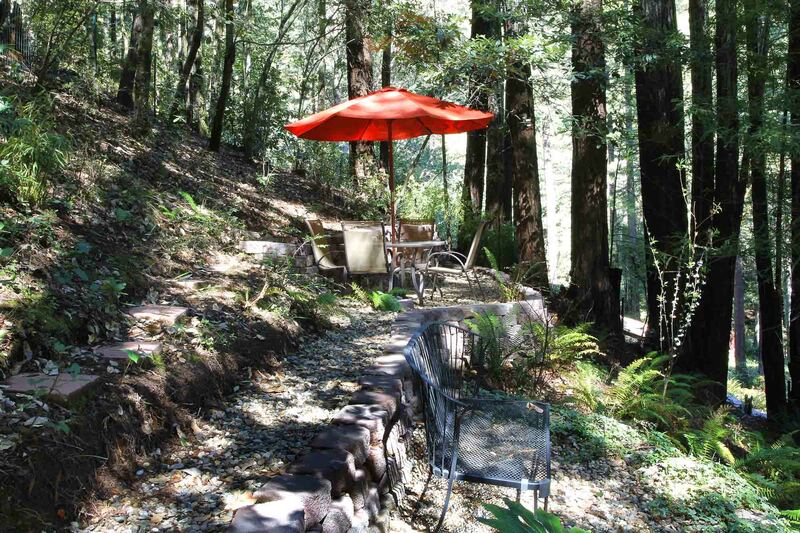 Would recommend for couples hoping to fine a woodsy respite not far from the river, the coast, and the downtown area of Guerneville. "All in all a fantastic place!" Wow, my daughter and I absolutely loved this home. In fact we are excited to return in the near future. When we first walked in and through all the living spaces indoor and out, the place was immaculately clean. We didn’t know what to expect and were pleasantly surprised. We both found the beds to be comfortable And there were lots of extra pillows and blankets in the closets. The kitchen was well stocked with all the cooking gadgets and utensils we needed. And we loved using the gas barbecue grill in the backyard every evening. The front patio was really cool looking and built around these gorgeous redwood trees. Every morning we liked to sit out there and drink our morning coffee and take in the beautiful forest. The road to get to the house was a bit tricky and narrow in spots but we got used to it after the first day. I would recommend following the directions given because you may lose cellular service in this area. It was great to have full internet service and cable television in the home. All in all a fantastic place! "This a nice house to stay." This a nice house to stay. I loved this place! Nestled in the woods, this has a great spacious backyard and an awesome deck too. To make things better they even had a small dog gate to close the deck so dog could enjoy the front deck with us. Great place and I would stay again. my only regret is I couldn’t stay longer. 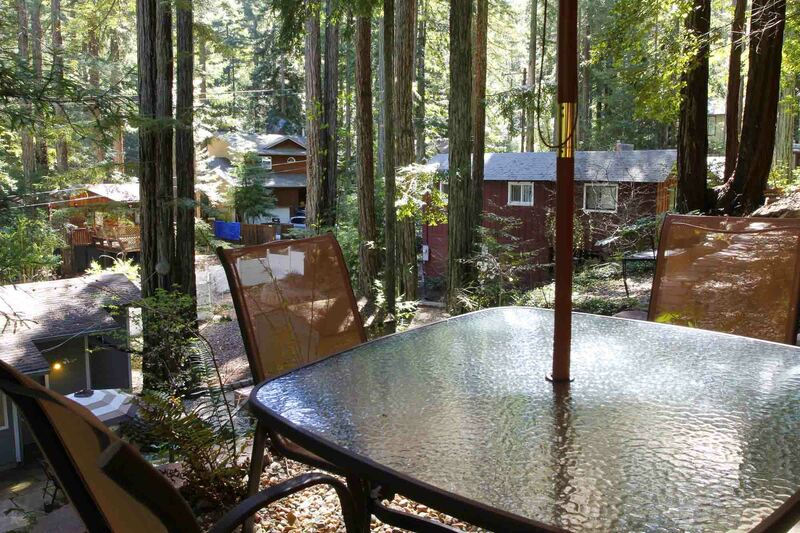 We spent the weekend with my in-laws at this spot and it was nicer than we expected - nestled among huge redwood trees, several patio areas, and comfortable and clean living space. We all commented that it was even nicer than the photos. It's a bit off the beaten path and secluded but you still have a paved road and neighbors. Highly recommend! "A hidden retreat in a unique place! " A hidden retreat in a unique place! Very comfy house, and good communication from Russian Gateaways. 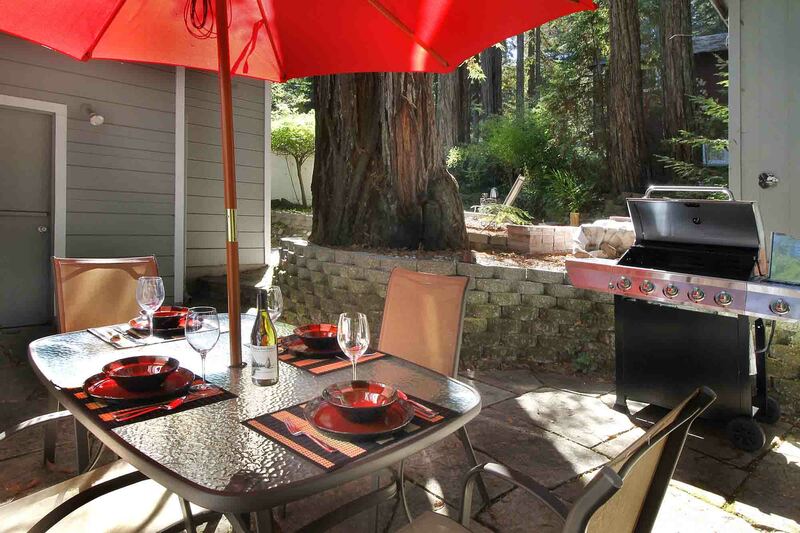 Nice place in the quiet hills of guerneville. I stayed here while my house was being worked on. Check in was really easy with the key code. The place was very clean and super up to date! Cute place with very comfortable beds, great WiFi and TVs. Quiet neighborhood. Thank you! The house was tidy and functional. We prepared a few meals in the kitchen and found it to be well-equipped with all the tools we needed. The beds are comfortable, but shakey if you’re not sleeping solo. And If you’re a tv person, this place has 4! Lots of books too if you happen to forget to bring one. The host River Getaways was very responsive the couple times we reached out. 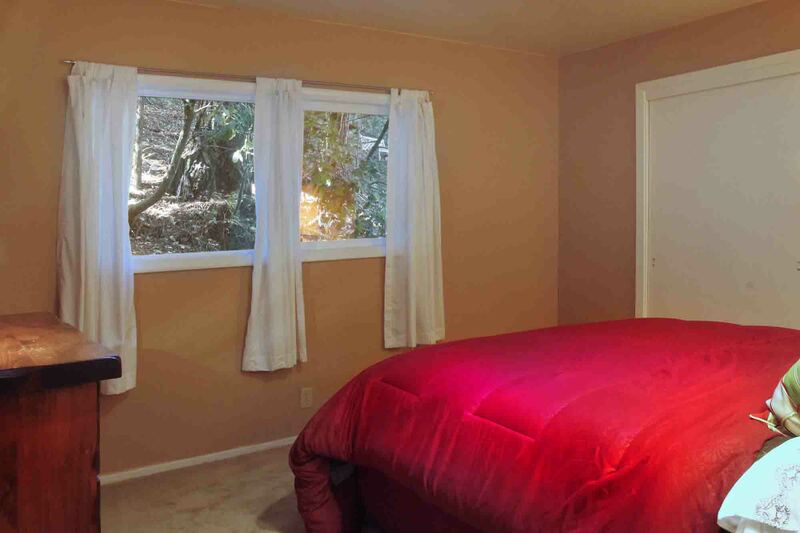 My family wanted to spend Christmas in Guerneville and it seemed like a good time to introduce them to Airbnb. I am very happy I did because we had our best holiday ever. Getting There: After turning off the main street you will find yourself on a somewhat narrow road which at times narrow down to a single lane. If you don't have a huge vehicle and drive politely you should be fine. Polite is a good word for this community of dense housing, which is at the same time funky and tasteful. I personally enjoyed these roads because the mix of structures and nature are definitely not something you get to see in big cities. Arriving: Wide driveway, tons of room for a single vehicle, or two. Walking in you see both fireplaces at the same time which really sets the tone of what is so great about this house. You will never be cold in this house, that's for sure. If you burn both fireplaces you won't need the central heating, which on its own also keeps the house very warm. Interior: Kitchen has a nice large counter great for dropping off things from your car while you "move in" for your stay. Appliances are all modern and very clean. There are more than enough kitchen gadgets and dishes to get you through your basic food prep. The only thing I wish I would have brought with me was fresh roasted coffee beans. Speaking of which there is a bean grinder and a coffee pot waiting for less forgetful guests. Family Room: Super cozy. 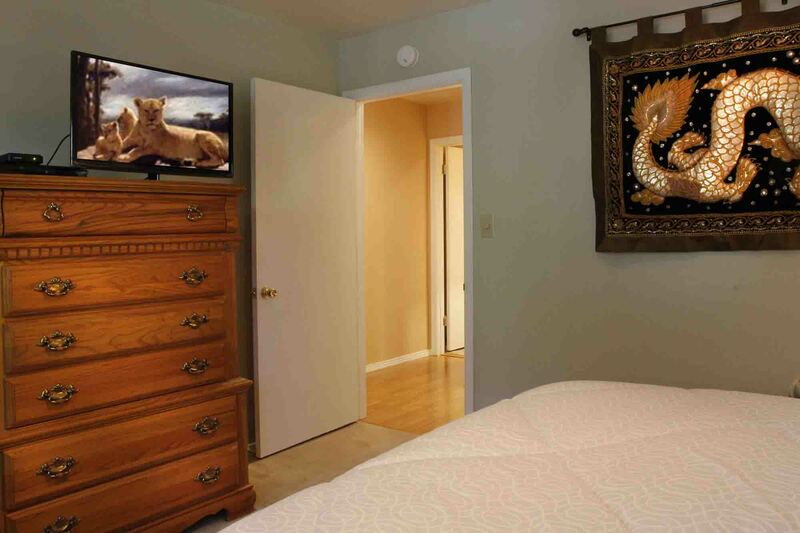 Nice big flatscreen with cable tv and very fast Internet. Comfy couch, fireplace, many books on the wall. Bedrooms: Comfortable beds. Flatscreens. Many extra pillows and blankets (which I did not discover until I was cleaning up on the last morning). Bathroom: Very clean. Make sure to read the signs about which side Hot and Cold are positioned in the shower. Outside: The front deck is simple and lovely. I assume a great place to hang out during Spring and Summer. The back yard has a gas powered grill and a charcoal grill (appreciated that though I did not use either), and a laundry house. Beautiful fern and redwood landscape the incline behind the house. Overall: We were very happy with our stay and look forward to coming back every year. Enjoyed our quiet stay at Good Times! The home was comfortable and all the outdoor seating options made sitting in the morning sunshine easy. Further removed from town than anticipated on a narrow one-lane street. There was no cell phone service, but the WiFi and television worked well. This is a very lovely and quiet small home. The drive from the main highway is narrow and slow with bumps and one way sections but still less than 10" from town. The reward near the end of a dead end street is serenity, both in quiescence and in the beautiful redwood landscape. 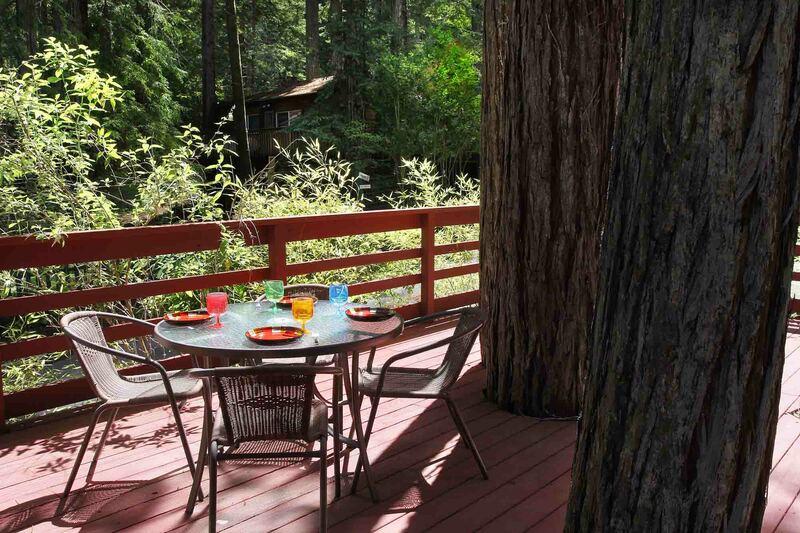 There are redwoods growing out of the road and out of the deck, and many places to sit inside and out. Inside it was clean with an amply supplied kitchen, nice decorations, and easy climate control. We had a great time. Our dog enjoyed it inside and out. There's a good variety of activities and dining within 20 minutes (more like 30 if you want the ocean). This was a great place to spend a weekend overall. 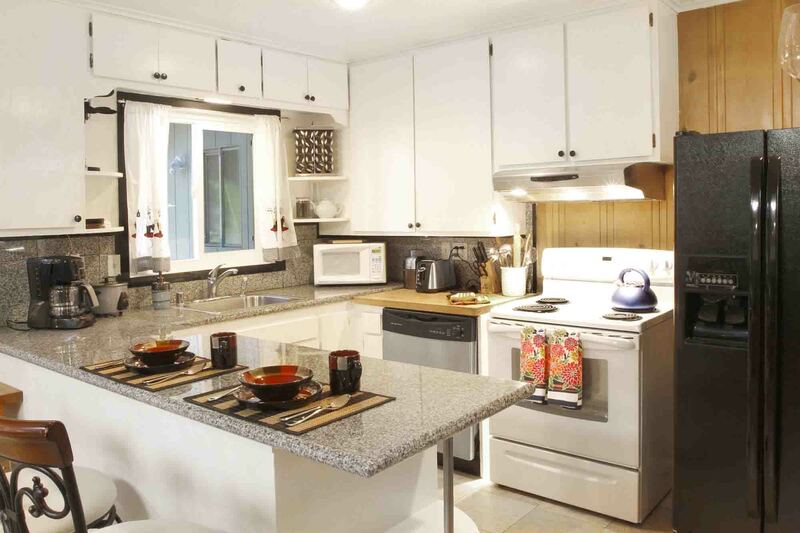 "Beautiful setting in a magnificent local"
Nice house, very clean and good kitchen for cooking. "Was a perfect spot for a quiet relaxing getaway"
I would recommend this place and I would stay here again. Great, clean and quite area. The woods are beautiful and charming. Nice grocery stores in the area also. A beautiful house in an even more beautiful setting. On a quiet cul de sac, The peace and quiet here is the best part. Our family had a great stay, and finding the place and checking in was a breeze. The beds were comfortable and warm. All in all a great place to stay. 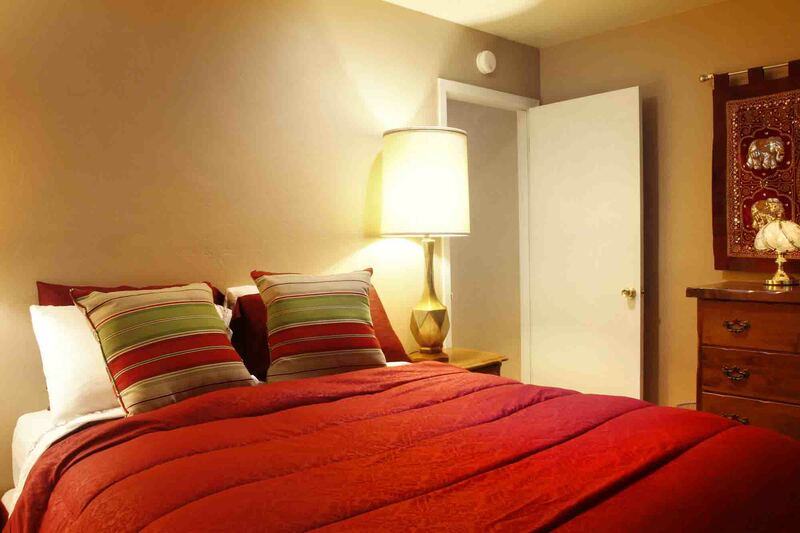 "Great place to relax and spend time with your family"
We love the place, very clean and cozy. You have everything that you need. I will recommend it to anyone, who would like to just take a break from the busy schedule and spent time in very quite and peaceful environment. "Fantastic place for the price! Very charming and comfortable." We loved it, will probably go back. Very comfortable and relaxing. TV in every single room which was nice since we have a kid. Fenced back yard was nice. Only thing that would fall on the negative side is that it is a little off the beaten path but that didn't really bother us. Amazing what else can I said Braine that we want to go back. Is big close to everything while been peaceful in nature. House is basic/rustic, dog friendly and clean. Well-equipped and updated kitchen. Musty smell - took the whole trip to air it out. Beautiful front and back yard spaces - if you're spending a lot of time outside, this is a good spot. Nice place pretty far off the main road (distance is short but about 10 -15 minutes driving through very interesting neighborhood with tall trees and Houses very close set to the road). Easily accommodated 4. Nice wooded back yard. House smelled a little damp but it was very clean and accommodated us nicely. Cozy and Peaceful location in the redwoods. You can hear the creek running outside the window. As usual, River Getaways went above and beyond by making sure the lights and heat were on when we arrived! The cabin was clean, cosy and had a great kitchen for cooking and socializing. There were even logs for the stove provided, a nice touch for the holiday weekend! The cabin is deep in the woods, it had an amazing backyard for my dog to romp and play. I can't wait to return in the summer to enjoy it! The four of us had a wonderful time there with our dogs. It was restful there and that is just what we needed. If you want peace and quiet that is a good place to go. The cottage is very warm and cozy as it was pretty cold during the week of Thanksgiving. Loved the getaway feel to a not so remote location! We had a great stay among the redwoods. 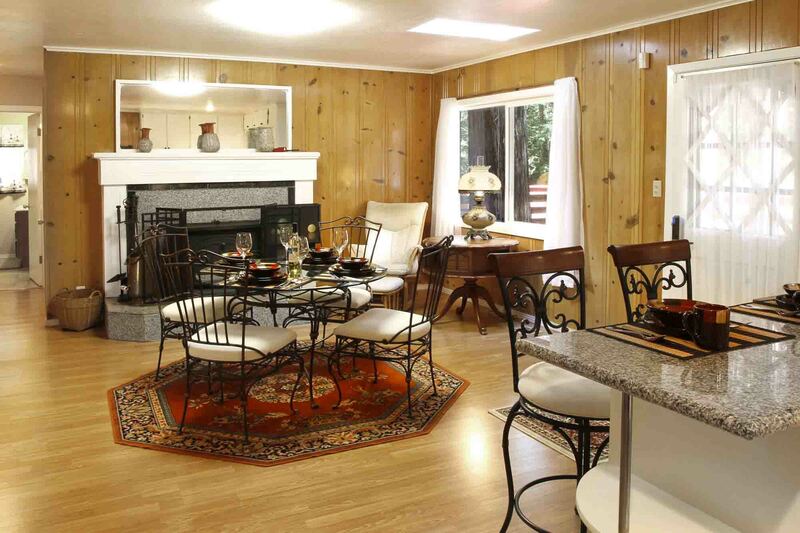 Great location near Guerneville, the river, Armstrong Redwoods, and the amazing beaches on the coast. Communication was great, and check in a breeze. prompt and clear communications, the house was in great shape and as advertised. I appreciated the easy keypad entry to expedite check-in, and the house was well stocked to make the stay comfortable and convenient. A fantastic place! 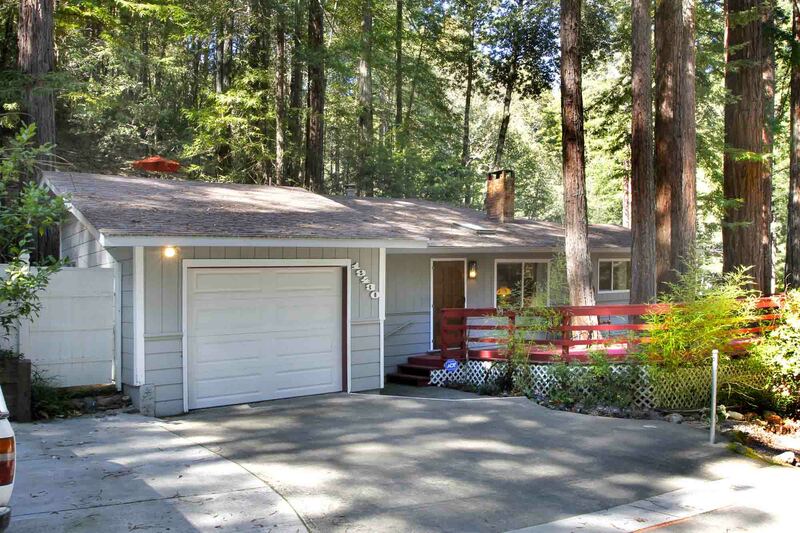 Great location, secluded but minutes away from Guerneville. The house was very clean and had a detailed book explaining all the rules and amenities. The owners were prompt with their communication and made check in a breeze. The beds were clean and very comfortable. Eclectically decorated. Made me feel like I was staying at a friends house. I would recommend it to anyone. 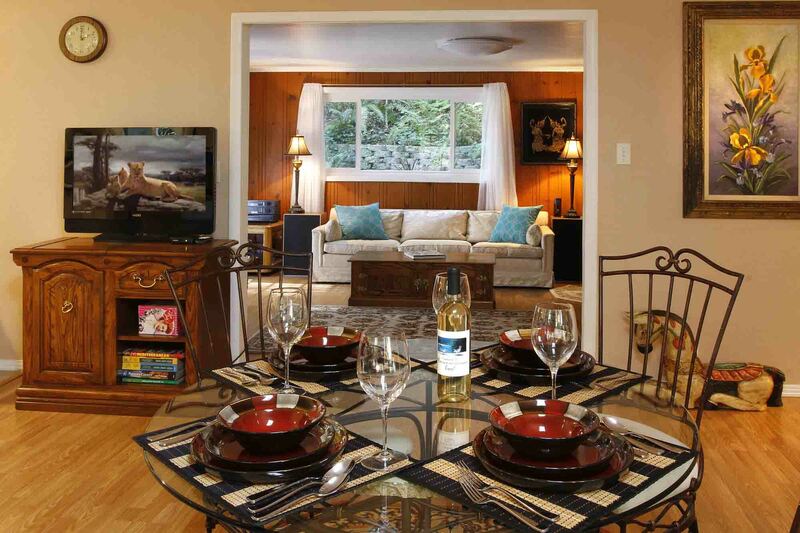 "Peaceful house in a redwood forest"
Good Times is a well-stocked roomy two-bedroom getaway with a ton of great outdoor space. The location is dreamy - up on a hill among towering redwoods, with the cool breezes and sweet smelling air you would expect in such a setting. It was so quiet I couldn't tell if the windows were open or closed half the time. The front porch and back patio were both great spots to hang out. It wasn't nearly as hot here as it was down in town, which was a bonus on days where the temperature was in the 90's. There were very detailed, helpful instructions in the binder for the rental with lots of information about the property and the area. This would be a 5 star review if not for a couple things that were challenging for me as a light sleeper - the beds and pillows were not the most comfortable - softer mattresses and acrylic pillows, which I just personally dislike. And - this is the big one- no light blocking shades of any kind if the bedrooms, just sheer curtains. Overall though, the place was wonderful and I highly recommend it. Lovely four days in comfortable, clean, thoughtfully decorated and designed house. Only complaint: the coffee-maker pour-while-brewing feature doesn't work, so I had to wait EXCRUCIATING MINUTES for morning coffee or swap cups and risk spillage. But seriously, that's nothing. The road up from town first seemed intimidating, but after doing it once or twice, no biggie. We loved the front deck in the morning, the back patio in the evening, and the steps up to bench and table in the overlook at all hours. A really nice place to stay: not overly overdone luxury nonsense but clean and comfortable and well-maintained. Looking forward to returning one day! The gardens are lovely, the home very comfortable with everything needed for a quiet stay in the forest. Easy drive into town and a short trip to the ocean. Quick access to outdoor activities. A very well managed and maintained property. All in all it was a great environment and the house was really well put together definitely wouldn't mind going back! The house is clean and as described. The location is not that good, it's pretty deep in the woods (almost no sunlight) and not that close to Main Street. "Great time at "Good Times""
This was such a nice home, immaculate, nice dcor and a beautiful woodsy setting. Town and Beaches just a short drive. They thought of every thing, all you need is your personal belongings and food, my dog was accommodated as well. We loved that there were 4 TV's in almost every room, it was nice to come home after a day shopping, exploring, being at the beach or the bar and have a little down time in our private spaces. Great patio to grill and enjoy the beautiful scenery. Beds were extremely comfy!!! Thank you for a lovely vacation, we would definitely rent this home again!